Members of the bomb disposal unit survey the site after a blast at a vegetable market in Quetta, Pakistan, April 12, 2019. A mere three weeks before a Pakistani minority was planning to celebrate a year of peaceful existence, an explosion ripped through a vegetable market, killing at least 18 people. 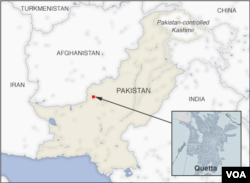 Police officials said the blast targeted members of the Hazara community, a Shi’ite minority primarily living in large clusters in Quetta in Pakistan’s Balochistan province, although eight of the dead were not Hazaras. The explosives were hidden in a sack of potatoes, according to the Deputy Inspector General of police Abdul Razzaq Cheema. The explosion shattered nearby windows. The attack happened despite a police and paramilitary security detail escorting the Hazara community members. No group has claimed responsibility yet but Sunni extremists have claimed such attacks in the past. 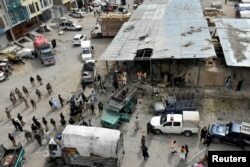 Rescue workers and army soldiers gather at the site of a blast at a vegetable market in Quetta, Pakistan, April 12, 2019. 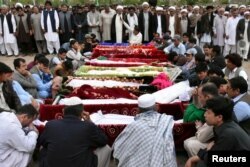 The Hazaras in Quetta have been targets of Sunni militants for years. Hundreds have died in either bomb blasts or targeted killings. One massive blast in 2013 killed more than 90 people. After several big attacks in 2013, the government installed check posts and assigned a paramilitary force called the Frontier Corps to guard the entrances of Hazara areas. However, the community complained that their social and economic life was stifled since they were only safe inside their areas. Many students complained of having to give up their dreams of going to a university due to security concerns. Other said they had to sell their businesses. Still, targeted killings of Hazaras in various parts of Quetta continued. Relatives and others gather at a funeral for the victims of a blast at vegetable market, at a cemetery in Quetta, Pakistan, April 12, 2019. Last year, a young lawyer and activist, Jalila Haider, led a hunger strike demanding protection for the community. After five days of going without food and water, she ended the strike only when the country’s army chief personally came to see her and promised protection to the community. After that the attacks ceased, until the current one. “People from my community had started moving around easily, going on picnics, we participated in elections, celebrated Eid and Muharram processions,” Haider told VOA. Her community, she added, was planning a big celebration for the 1st of May, the anniversary of her meeting with the army chief. “After this attack though, we are planning another protest,” she said. The violence over the last several years has led thousands of Hazaras to migrate from Pakistan, sometimes illegally.